Taking advantage of free Thanksgiving scrapbook supplies can help you preserve your favorite holiday memories while sticking to your budget. When it comes to scrapbooking, creativity is always more important than cash! Get creative with these fun holiday downloads. These Thanksgiving scrapbook paper and border designs are PDF files. After you've saved them, print them out onto high-quality, archival, acid-free cardstock and trim as needed. Remember that a little goes a long way when using seasonal patterned papers and embellishments. You want to enhance your photos, not draw attention away from them. If you need help downloading and printing the files, use these helpful tips. 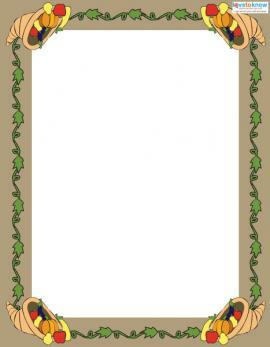 Download this pilgrim and leaf scrapbook paper. 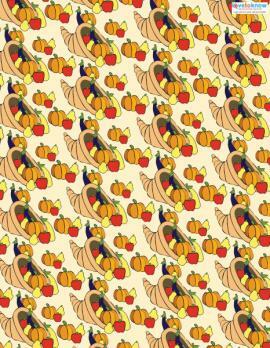 Download this cornucopia scrapbook paper. 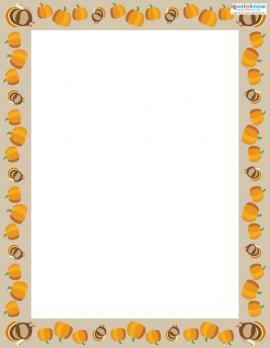 Download this pumpkin scrapbook border. Download this cornucopia scrapbook border. Scrapbook Scrapbook has downloads of several printable papers and embellishments, including watercolor papers in autumn colors, leaf patterned papers, pumpkin accents, and Thanksgiving word art. Shabby Princess has a free "Plentiful" digital kit with everything you need to scrapbook fall memories from Halloween to Thanksgiving and beyond. The different elements have a sophisticated vintage feel. If you want to use the graphics on a traditional scrapbook layout, try printing them on textured cardstock or vellum for a unique look. Easy Digital Scrapbooking has a collection of word art and simple patterned paper designs for preserving your favorite Thanksgiving memories. Downloads don't necessarily have to be labeled as scrapbooking supplies to be appropriate for use in your layout. You can use free printable Thanksgiving clip art on your scrapbook pages by adding images to borders, journaling blocks, or tags. Printable Thanksgiving place cards could be repurposed as journaling blocks or spaces for writing photo captions. Photo cards can be used as mats for your favorite holiday images. LMS Turkey Day: Perfect for traditional Thanksgiving scrapbook layouts, this font features sans serif capital letters inside a black and white turkey drawing. LMS Puritan Party Hats: This fun serif font features tiny pilgrim hat embellishments with the letters. 101! Punkin Pie: If pumpkin pie is your favorite part of the holiday, you'll love this free font. All the letters are nestled inside individually drawn pies. Another fun idea is to use funny Thanksgiving poetry to describe the scene, and use a festive font for the first letter in each line or stanza. 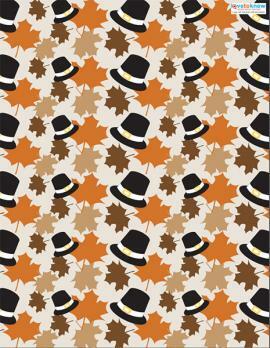 Punch small squares from scraps of cardstock in traditional Thanksgiving colors. Ask everyone to write down something that they are thankful for and sign their name. Arrange these squares along the side of your layout for a personalized scrapbook page border. Scan copies of treasured handwritten recipe cards to include in your scrapbook layout. Since so many Thanksgiving memories are about the holiday meal, this bit of memorabilia will make your layout a special keepsake for future generations. Make your own free Thanksgiving scrapbook paper by taking a picture of your family feast, then reducing the opacity to 30-40%. Alternatively, you could journal over the top of the photo by printing text onto white vellum. If you have a small child at home, use a hand print turkey as an embellishment for your Thanksgiving scrapbook layout. Apply ink or acrylic craft paint to leaves with defined shapes to use as your own free rubber stamps. Create photo corners for your layout by cutting apart paint chips that feature autumn inspired color schemes. Tear a brown paper bag to use as a photo mat on your layout. Add definition by going over the edges with a brown ink pad. Use corrugated cardboard scraps or twine from product packaging to add a rustic touch to your page title or journaling block. Use product packaging, such as the cardboard from a box of stuffing or the label from a can of pumpkin pie filling, to create decorative tags for your pages. Save a pretty napkin or place card from your meal and add it to a memorabilia pocket. As you create your Thanksgiving themed scrapbook pages, do not forget the purpose of this holiday. A successful Thanksgiving scrapbook layout showcases the blessings you are most thankful for, not the amount of money you spent on supplies.